Don’t wait for major leaks in your roof before addressing the need roof repair. If you do, one big rain storm is all it takes to cause a lot of damage to the exterior and interior of your home. Rain water can cause stains, warping, buckling, ruined drywall, and can provide an environment that is more conducive to mold growth. With all these negative consequences, it’s important to know the signs that indicate a need for roof repair before too much damage is done. Below is a list of three telltale signs to be on the lookout for that indicate you’re in need of roof repair. 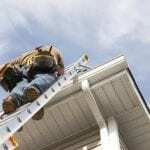 If you find pieces of roofing materials in or around your gutters, it means that the roof is starting to breakdown and needs to be repaired or replaced. You may discover water dripping from your roof, especially in the attic of your home. You may also see stains on your ceilings, which could indicate leaks in the roof. Another common warning sign is the condition of the shingles. If they appear heavily faded, warped, or are starting to curl, these are indicators that you need roof repair. 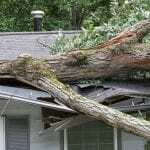 These are all early warning signs and while serious damage may not be occurring to your home, it’s better to avoid any damage by carefully keeping tabs on the status of your roof. Call in to have your roof examined if you have any concerns. Even if you just need a few repairs, taking care of them now can save you from more hassle later on!